Our skinny 2.75 inch cream ties are very popular for weddings and with schools, choirs, sports teams, embroiderers and individuals looking for a quality skinny tie at a discounted price. This skinny tie is a modern 2.75 inch width and standard adult length 57 inches long. If you are looking for that modern skinny look in a tie, then this might be the right tie for you. Sporting a luxurious satin finish with just the right amount of sheen, our solid skinny cream 2.75 inch necktie features a full lining to provide superior body & feel to the necktie, allowing it to make excellent knots and last for years of service. Slim cream ties are made in a variety of styles, shapes and shades. This cream tie is a very light shade of yellow. Perfect for weddings. The material is satin finished with a medium amount of sheen, which means it does have some shine, which creates variation in the exact shade/brightness that is shown at any given moment, depending on the amount, type and angle of the light hitting the tie. If the exact shade of this necktie is a concern, please read our color matching section to help. 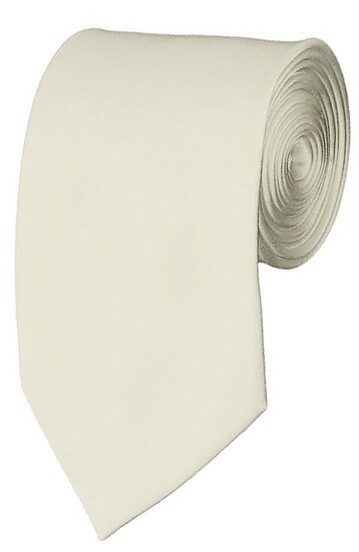 This cream tie is a skinny tie, but still has a regular tie shape to it. This means that it is not the type of tie that almost looks like it just goes straight up and down. The width of this tie tapers from the knot to the widest point of the tie, right before the tip. If you are looking for a 50's or Blues Brothers style tie, you are looking for a 2 inch skinny tie, not this 2.75 inch necktie. The width of this skinny tie is approximately 2.75 inches right before the tip, which is a very popular width for skinny ties. The tie is approximately 57 inches long, which is standard adult length and should fit most guys from 5' 2" to 6' 1", depending on their build. This satin finished necktie is marked Dry Clean Only. It is recommended that you do not machine wash it, if you do there is a good chance it will never be right again. If the tie will be worn in a environment where it will be regularly be subject to stains (such as wait staff), we suggest for added longevity using an anti-stain spray such as Scotchgard. Brighter ties when worn in conditions where they become very damp or completely wet, like other garments may run.